I saw the difference in my skin tone overnight! My skin was clearer, brighter and luminous. I love finding products that work quickly, less testing time and more time to enjoy the benefits. True Tone by PCA Skin interrupts and prevents melanin production, preventing future hyperpigmentation scars. I still suffer from adult acne and can’t resist picking at my skin. The antioxidants and anti-inflammatory properties are what help make Brightening Therapy True Tone so effective. The Web Site has sections devoted to skincare education, and a glossary for terminology. Don’t you want to increase your skins luminosity? 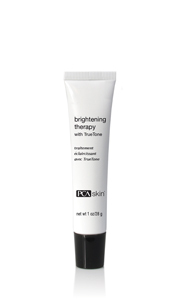 Brightening Therapy True Tone by PCA Skin gets a TEN!